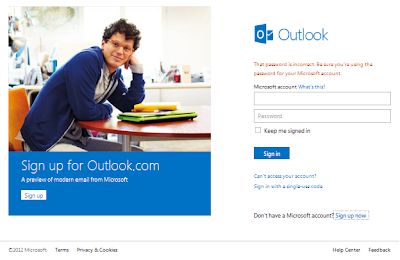 Microsoft has recently released outlook.com with awesome services. Outlook.com is a new online email portal and it is superior that any other mailing service in terms of features and user-interface. ==> Once users connect their mobile number to their Outlook account, they can easily sign-in to their account from any computer without using their real password. All they have to do is to click on “Sign in with a single-use code” link and Microsoft will send a temporary password that can be use once via text message to their phone. This feature is good when a user is accessing their Outlook account from a public computer. ==> Outlook.com automatically detects all incoming mails that are newsletters and put them in a separate folder with a one-click unsubscribe button. With this feature, users will be able to easily unsubscribe to junks newsletters. ==> Outlook.com users will be able to access Microsoft’s suite of productivity tools including Microsoft Word, SkyDrive, Excel and PowerPoint from their inboxes. Very soon, skype video calling capabilities will be added to Outlook.com inbox to enable users have video chats through their email system instead of using an application. ==> Outlook.com opens speedily and it offers unlimited storage space. ==> Users can now attach file of any size to their mails without restrictions. Here are just few features of Outlook.com, you can check it out yourself.